My friend Tony Headrick is a super talented designer. His studio, Neno Design, has won design awards and he’s created some of the coolest logos and websites around Fort Wayne (including my blog’s logo!). We decided we wanted to work on something together. Trouble is, I’m not a designer, and he’s not a writer. Luckily, we figured it out. Presenting: the Woodclinched Pencil Vector Pack! It contains 14 pencils from my collection, some vintage, and some new. I tried to include a variety — including an old bullet pencil and a fancy antique mechanical pencil — in addition to straight-up wood cased pencils. To me, pencils are one of the most accessible and basic art tools. Working with Andy Welfle, a professional pencil collector, made the experience so worthwhile. Andy provided some of his favorite pencils, the history behind the design and it was a real privilege to be trusted with such unique, vintage and storied pencils. It was a real challenge to try and keep the design minimal. The colors, materials and textures were what really stood out. Just look at the detail between various lengths o points, and of the sharpening of the barrel between round and hex pencils. He did an amazing job, too. As someone who doesn’t normally spend a good portion of his day thinking about wooden pencils, he caught a lot of detail: how a hex pencil differs from a round pencil where the tip meets the paint; how the shape and tip of a carpenter pencil differs from, say, a regular round pencil; the shine pattern on a ferrule or a tipped end. From a design perspective, I love how he managed to keep the design pretty flat and basic, but was able to incorporate a lot of detail, still, like the woodgrain and that shine on the barrel. What is a “Vector Pack”? What does one do with a vector pack, all you non-designers may want to know? If you’re a designer, or find yourself in a situation where you may want to use a pencil like this in a design, then this might appeal to you. Rather than a raster like a JPEG or a PNG, a vector file allows you to scale an image up or down infinitely, keeping its shape and integrity all the while. Plus, you can easily change color, add text, or otherwise manipulate your image to fit the needs of your project. Click the image to go see the full vector pack at The Creative Market, and purchase for only $5! 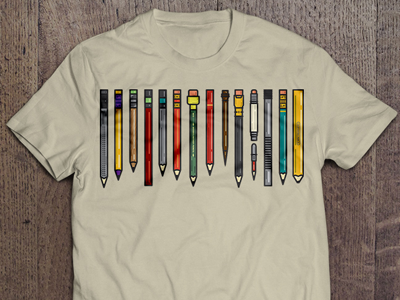 This includes all 14 pencils and is for sale for $5 on the Creative Market! This is coming soon. I’ll definitely have more information when we get this up and going. We’re going to submit it to The Cotton Bureau to crowd fund the printing of these t-shirts. I’d be all over that t-shirt. Or, rather, all inside that t-shirt. Fund, crowd, fund! 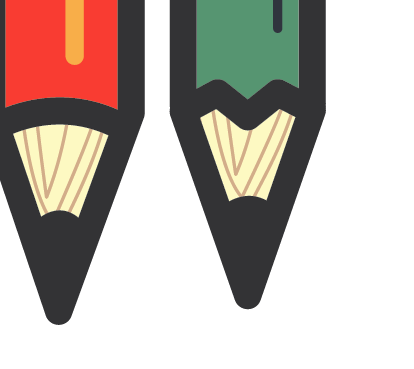 Super cool Woodclinched Pencil Vector Pack for FREE! And there are plans to release the bunch as t-shirt! WANT! I LOVE what you’ve done here! In fact, I love your whole blog.